Wow Ethan...we give all this helpful advice and you're taking the easy way out. Tyler wrote: Source of the post Wow Ethan...we give all this helpful advice and you're taking the easy way out. I'm going to mount it! Just not quite yet! Looking at mounts though, the one you suggested seems to be a good option, as it extends 20" from the wall at the furthest. Without having measured I would think that would be far enough. Just measured. I should need at least 10" from the wall. That one will be more than enough. Just ordered the mount you suggested. You gonna come help me mount it this weekend? But really, measure first and make sure you hit a stud. 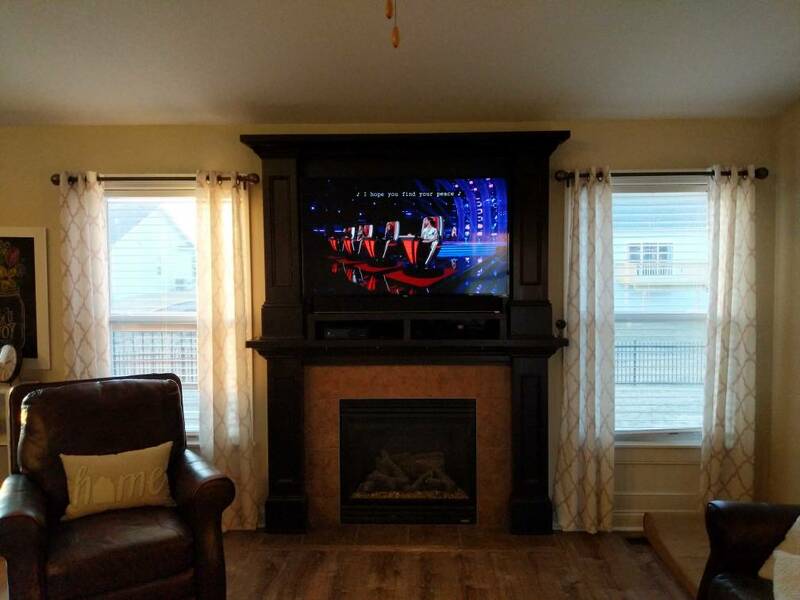 Hanging a TV isn't hard. Just have to do the math with where to mount the wall bracket after figuring out how it fits onto the tv. We haven't heard from Ethan since he got his TV mount. We can only assume some freak accident happened during the install because of the lack of impact screwing. Poor guy. We hardly knew him. I'm still here. We mounted a new TV in the bedroom and it's awesome. My father-in-law convinced me to keep the TV on the shelf without a mount, so I returned it to Amazon. We ended up getting a couple of 2x6s and cut them to the exact size we needed to support the TV stand feet. They are mostly hidden by the soundbar that's placed in front of the TV on the shelf. I don't plan to mount the TV any time soon. I will send a picture when I get home. We also had new flooring installed in our living room this week so I've been busy with all that. I did buy a new dual desk monitor mount with the money I was planning to spend on the TV mount so I will post about that in the respective thread. Wow!!! So you value your father in laws opinion more than ours?!?! I feel cheated. I'm judging until I see the finished product. That looks nice. I can't even see the wood you cut thanks to the sound bar. Much nicer look than the unfinished wood from before. Haha. Still think mounted is superior, but this is for sure a nice improvement. I see you moved the camera too. Tyler wrote: That looks nice. I can't even see the wood you cut thanks to the sound bar. Much nicer look than the unfinished wood from before. Haha. Unfortunately there are angles at which you can see the wood. We plan to paint it dark brown to blend it in. Moved the camera to get a better view for it. Also swapped out the white default cord that shipped with it with a black one (luckily it's micro USB so I have plenty of those laying around). Tyler wrote: Not finished? What's left? Just the bottom shelf. I had to rethink it since I mounted the sound bar. Update: saw this on slickdeals last week for ~$7. This would have solved my issue from the get go because it allows you to adjust the height of your TV's 'feet'/stand. Bought it and set it all up on Monday. Now we don't need the wood blocks at all, and the soundbar doesn't block the bottom of the screen when you're sitting closer to the TV because we were able to raise the TV up a few inches. I'll post a picture later. Highly recommend this product if your TV's original feet/stand don't work for you and you aren't mounting. Good idea. I saw this last week and thought "who is this for? People that lost their stands". Your problem makes more sense. Tyler wrote: Source of the post People that lost their stands"
I also could have used this with my previous TV - I bought it with a mount/stand and proceeded to mistakenly throw away the stand. I had to search Ebay to buy a used stand for the TV. This would have been cheaper/easier.